Pinoy animation has been around for almost four decades now. Yet, to-date the industry has been able to produce only four original feature-length animated films. The first has been Ibong Adarna (Adarna: The Mythical Bird), created by Geirry Garcia along with Guiding Lights Production and FLT film in 1997. The film is the adaptation of a book that tells the story of a sick king, who can be cured only by the singing Adarna Bird. His three sons,therefore, set out on a journey to find the bird. They will have capture it without falling asleep or else they will turn into stone. Eleven years later followed Urduja (2008) by father and son Mike and Antonio Tuviera. The protagonist of this film is the legendary warrior Princess Urdula, on whom depends the Tawilisi tribe. She falls in love with the Chinese pirate Limhang, who has escaped from the greedy conqueror Wang. However, Limhang surrenders and joins Wang in assurance that the later will not attack the Tawilisi again. Towards the end of 2008 another animated feature film was release: Dayo sa Mundo ng Elementalia, which was directed by Robert Quilao, and written by Artemio Abad and Eric Cabahug. 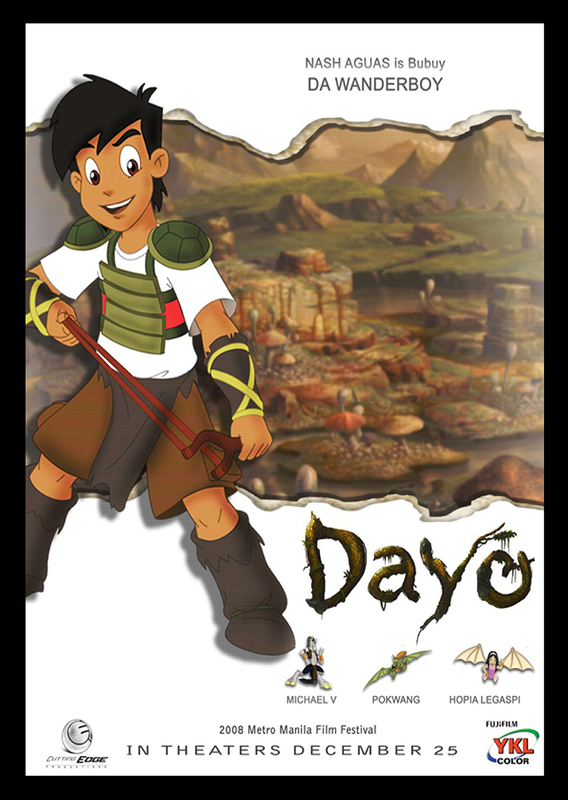 Dayo is about a little boy named Buboy, who lives with his grandparents. The abduction of his grandparents leads him to acquaint with an elemental creature named Anna. Indeed, to save them he has to go to Elementalia, a magical and mystical under world. Two years later was released the most recent Pinoy feature film: RPG Metanoia (2010) by Luis C. Suarez. This film, which was the first 3D animated feature locally produced, is about a young online gamer with a low self-esteem named Nico, and depicts children that are into Massively Multi-players Online Role Playing Game (MMORPG) or simply RPG. In particular, Nico is into a game called Metanoia, due to the fact that through it he can acquire heroic and powerful qualities. When an Internet virus infects Metanoia and starts controlling the mind of its players, Nico and his friends set out to save both the world he lives in and that of Metanoia. It has been seven years since this last production, and no other animated feature has yet been made in the Philippines. Although the four animated films in question have all been well received, none has made profits or coped with its production cost. An animated feature is intricate, intensive and expensive to produce. The question as to what went wrong for these four animated films is hard to single out. Often, the fiasco of an animated film is due to the following reasons: the lack of animators with a good skill set; a shortage of technical support; mismanagement; insufficient funding and marketing; a lack of support on the part of the government, the distributors and/or the audience; a very westernized (or disneyfied) design; the absence of post-production analysis and discussion. Due to posting limitation, I will not be able to discuss each of the aforementioned points in respect to local animation, but I will give my thoughts on each of the four feature-length animated films. 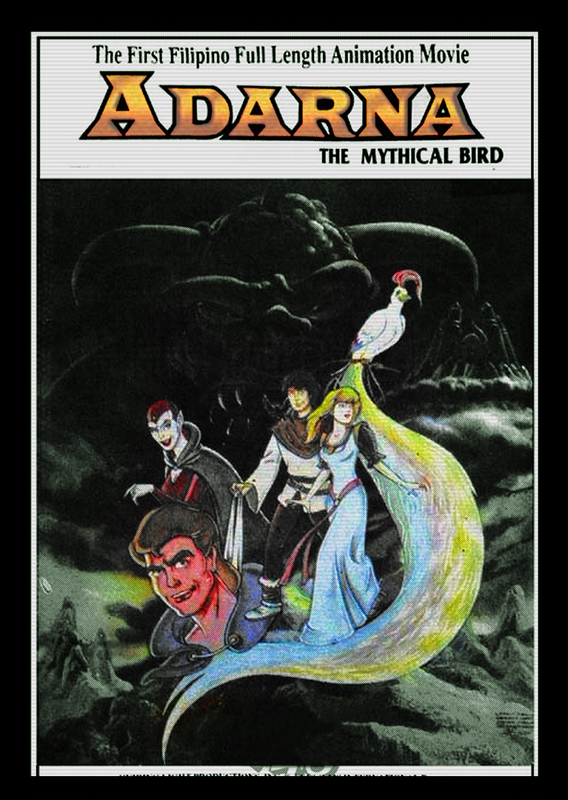 Being the first attempt, Adarna: The Mythical Bird came in late for a decade old industry which was first recognized as sub-contractual or outsourcing for foreign animation. The release of the first animated film could have been earlier and hook to the frustration and strength of the first but unrecognized animated film, Tadhana (1978, by Nonoy Marcelo). Indeed, Joseph Insect states that the first animated feature of the Philippines was Tadhana, a 60 minute film based on a series of volumes of unofficial Philippine history written by President Marcos. Marcelo was commissioned this film (as most of his works) by the former President Ferdinand Marcos’ daughter, Imee Marcos, and Tadhana was broadcast on September 1978, during the 6th anniversary of the declaration of Martial Law. Tadhana’s destiny as the first full length animated film was adverse, it was supposed to replay and even have commercial theater release, but for some reasons unclear, it was never seen again. Moreover, Tadhana was not credited by the industry as the first feature, since animation was recognized only in its “Golden Years” in the 1980s. Conversely, original content television series and feature film already demonstrated the desolate acceptance of local audiences. Animation had its take as an industry in the 1980s, and so Adarna: The Mythical Bird could claim to be the first in 1997. The diffusion of digital animation – and more precisely the birth of 3D animation – has weakened the marketability of Adarna: The Mythical Bird. Generally, the rise of 3D animation technology has created an alarming status for 2D or traditional animation. Tadhana and Adarana: The Mythical Bird’s attempts have taught us to hone the local animation industry in the production of original content feature film in terms of archiving, process and skills needed in the production. 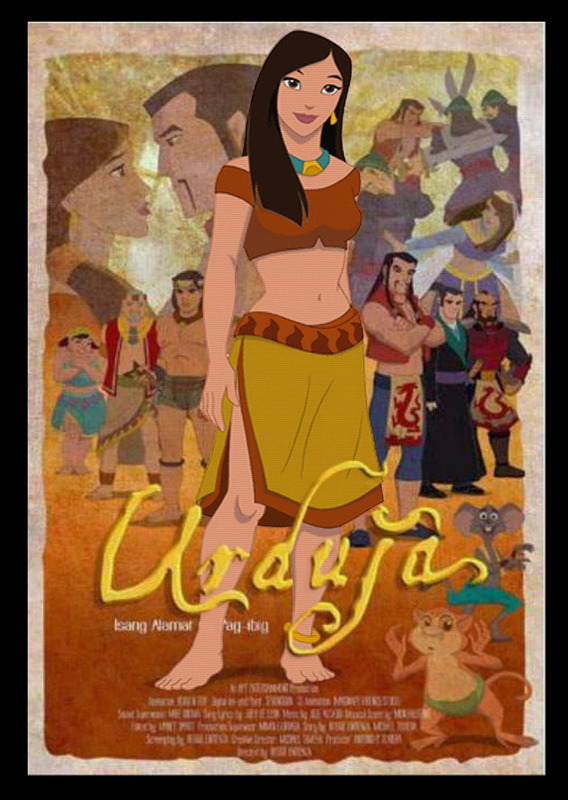 Although it took the industry another decade to produce the subsequent animation, there was a great aesthetic and technical improvement in Urduja. It was the second highest box office grossing among the four feature-length animated films, and the only one released in the middle of the year. Urduja is a strong proof of western influence. The character design and the use of anthropomorphic sidekicks recall very much Walt Disney Studios’ Pocahontas (1995) and Mulan (1998). In other words, they are disneyfied. It might be coincidental, but since Filipino knowledge in animation originated from the Western countries, it is to no surprise that Pinoy animation is greatly influenced by it. Also, there is a perception within the local industry that the success of an original animated movie depends on copying the tried and tested Disney formula, which is also requested by the local audiences. Yet, this commercialism leads the audiences to perceive that the industry is incapable of creating its own identity in animation. At current, due to a lack of governmental support and an absence of a direct policy regarding the local shows for television and movie theaters, viewers are bombarded with foreign animation, and this has become the yardstick in respect to which an animation is judged as good or bad. As another attempt to combine 2D with 3D animation, and the first paperless animated film employing high definition resolution, Dayo sa Mundo ng Elementalia was a good attempt at employing current technology. Yet, it is a reflection of the industry’s lack of funding and support. Cutting Edge Production was able to sustain the expenses through bank financing and sponsorship from their advertising clients – which appeared in most shots of the film. If animation were well funded, then at least for this movie Bubuy would not have taken the burden of carrying a bag full of unnecessary shots. 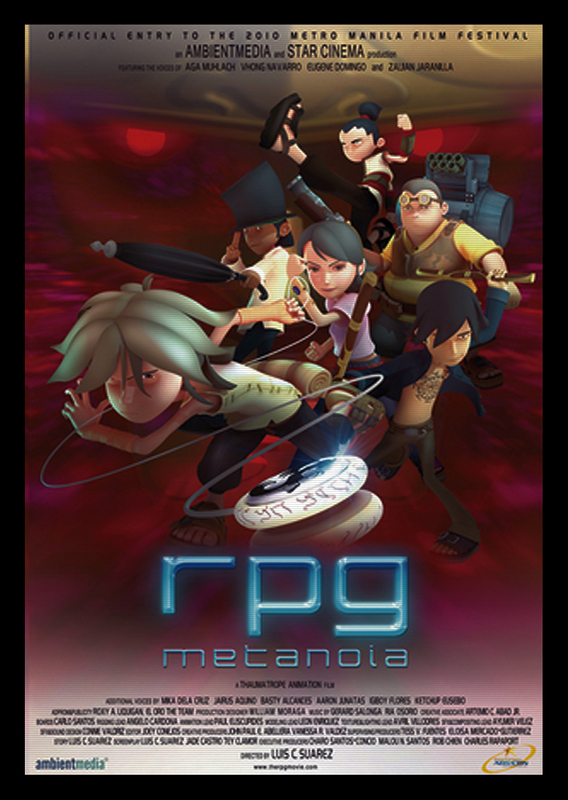 RPG Metanioa represents a great improvement on the part of the industry. It was the first successful attempt at digital animation fully made employing the 3D technique. Unfortunately, the two time bagger of animated films in MMFF and Tanging Ina, a top grossing comedy drama from the same distributor of RPG Metanioa (i.e. Star Cinema), won over the family oriented animated film. The industry often assumed that the target market of an animated film is children. The last two animated films were made particularly for a younger generation, since they are both dealing with childhood fantasy, courage, heroism, bullying, relating with adults, making friends and other Filipino day to day life events. It is demeaning to consider animation as only meant for children, and it is high time to think that animation can also be for young adults or even adults or a bridge between two age brackets. Dayo and RPG Metanioa were successful in bridging the gap between the young and the adult target market. However, the Filipino general masses which are often the moviegoers during MMFF are fascinated with horror, comedy or period drama and less with animation – a separate research would be needed on the perception and reception of animation among Filipinos. Backlog in technological development is another problem of local animation. First, it took some time for the industry to employ and adapt to digital animation. Secondly, the supply of software and hardware for animation is limited and excessively expensive. Third, the limited presence of Internet is disadvantageous for international investors. The reasons for the lack of success of the animated film in the Philippines could therefore be many, and could involve domains such as education, economy, finance, technology and resources. And each problem is linked to others. For this reason, I personally think that there is no one solution to the problem. Rather, only a thorough rethinking of the entire industry can bring actual results. Love Cabrera Asis earned her MA in Fine Arts and Design in April 2015 at the Philippine Women’s University. She has since been working as a consultant for animation studios such as Toast and Brew Game and Animation studio, while actively teaching animation, multimedia, visual effects, fine art, and digital arts.